This item requires an Federal Firearms License (FFL) to be sent to us before we can process the order. This is a replacement stainless steel receiver for the Ruger 10/22 LR rifle. It is CNC machined from a solid billet of 416 stainless steel and designed to fit the Ruger 10/22 aftermarket parts that are available. 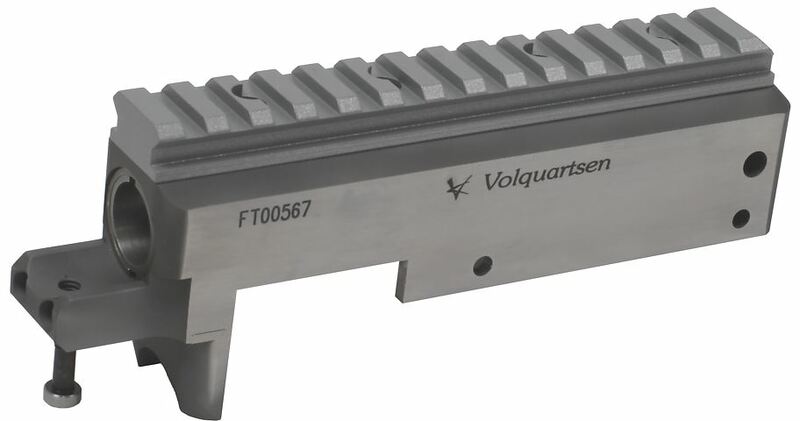 Volquartsen's receiver is not a casting or a forging that has some machine work done but a true CNC machined receiver. The receiver comes with Volquartsen's Picatinney style base installed along with Volquartsen's recoil buffer for quiet cycling of the bolt. The barrel is installed using Volquartsen's new tapered cone bushing installation system. The tapered cone bushing prevents downward canting typically found on 10/22 barrel installation. It can be used with any 10/22 barrel and will assure a concentric tight fit from barrel to receiver. Threading is no longer needed to achieve the tight fit necessary for optimum accuracy. We think you'll agree that this receiver is the ultimate receiver for any shooter looking to build up a semi-auto 22lr rifle. Available in either Black or Stainless Steel finish. Federal law requires that the receiver be shipped directly to a dealer with a Federal Firearms License (FFL). It is your responsibility to make arrangements with a dealer with an FFL to accept delivery of the receiver for you. Before we can ship the receiver, your dealer must send us a copy of their FFL with an original signature. Dealers can fax a signed copy of their FFL to 1-888-622-2240. Orders for receivers will not be processed until we receive a signed copy of a FFL from a dealer that you have selected. Please make sure that your dealer sends us a copy of their FFL promptly as orders for receivers are processed in the order the FFLs are received, not in the order the orders are placed. The machine work on this receiver is top quality and built to last forever. Along with the super fast shippping I really couldn't be happier. For a quality, high end upgrade that promises many, many solid years of use. I found the extra weight of the SS receiver as a balancing mass supporting my heavy bull barrel, giving a solid feel to my rifle.